For the past several years, Scott has made Door County Cherry Rum Pie for Thanksgiving, and they have been perfect. This year was a different story. I had to buy the frozen cherries at a local grocery store, but I only bought one container, 28 oz, which I thought was enough. It turned out that we didn't have enough cherries, so he added a cup of raw cranberries. Also, in previous years he had cooked the cherries with cornstarch on the stove to thicken the filling, but this year, he didn't. 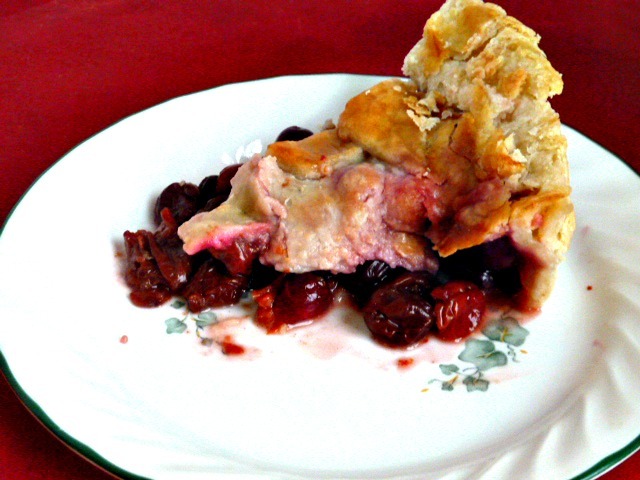 He just added sugar, cornstarch and rum to the cherries and cranberries, and put that filling in the pie shell. It turns out that the cherries I bought were already sweetened, and he didn't realize that until he had already added the sugar. The pie baked beautifully and tasted so good, but the filling never got thick, so the fruit wouldn't stay in the crust, once it was cut. He even made cute little pastry cut outs of a cherry and cranberries. The pie was gorgeous, before it was cut:) The cherry cranberry filling was tart, but still sweet enough. but the consistency was not as good, too runny. Needless to say We ate anyway, with scoops of French Vanilla Ice Cream! This festive pie would be beautiful addition to any Holiday table. Make pie rust and refrigerate until ready to use. He used Michelle at Brown Eyed Baker's Recipe for Perfect Pie Crust. 1. Combine sugar, flour, and salt. Stir into reserved cherry juice and rum. Bring to a boil, stirring. 2. Reduce heat, and simmer for 5 min, till thickened. 3. Stir in butter and cranberries and refrigerate. 6. Place pastry circle on top of your cherry filling. Cut a few large slits on the surface to allow steam to escape. Crimp edges as desired. Brush with egg wash.
7. Bake 30-35 Min., until pastry nicely browned. Cool on wire rack. Serve warm. Enjoy! The crust turned out really wee, the filling, to runny, but it still tasted soo good. I love a good pie and this definitely sounds like a good pie! Perfect time of year to make it, I will definitely have to try this recipe! This pie is a great addition to any holiday table. with vibrant color and wonderful taste of cherries and cranberries combined. oh my goodness what a gorgeous Holiday perfect pie! this pie would be a welcome addition to any holiday pie! 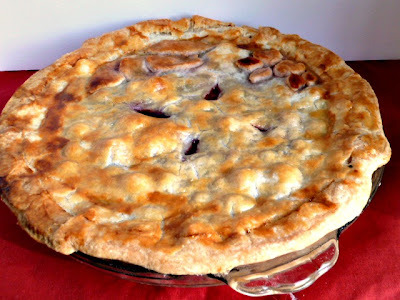 your pie looks sweet, tangy, slighty crunchy... so many wonderful textures and flavors meshing together! 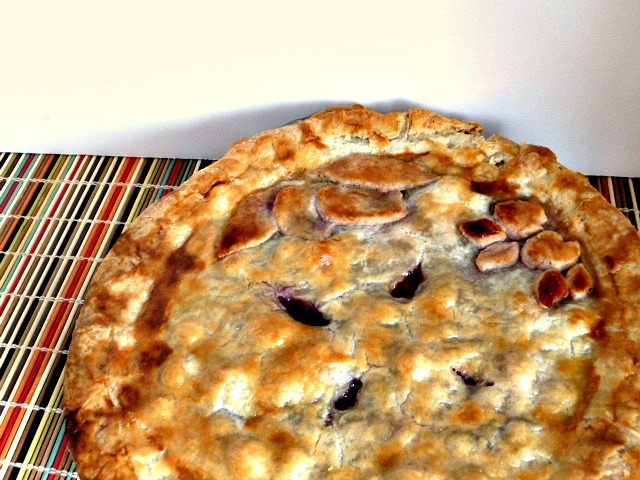 this pie does have wonderful flavors, and the crust is flaky! Perfect for a Holiday table. Oh no, runny pie, but I'm sure it tasted wonderful. I wish we had cherries here now, pie sounds so good. Hope you are having a wonderful week. Candy Bar Blondies with MM's, too.